DELFTship is a complete design package for application in the marine industry. It is characterised by its ability to create any kind of hullform, high flexibility, low learning curve and visual approach. It can be used for almost any kind of floating object. DELFTship uses subdivision surfaces to model the hull rather than NURB surfaces. Most hull modeling packages use these parametric spline surfaces which can be very tricky to use. Subdivision surfaces offer many advantages: 1.) No need for a rectangular control grid divided into rows and columns. 2. )More freedom in modeling knuckle lines. 3. )Surfaces can contain holes. 4. )Even the most complex shapes can be created with just one surface. 5. )The possibility to insert just one single control point. Web Site Snapshot: If available, above is a snapshot of the Delftship web site at http://www.delftship.net/ as it appeared when this site was added to the directory or last verified. 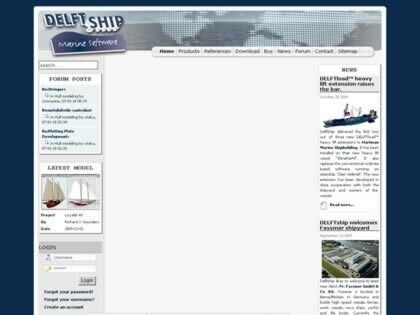 Please Note that Boat Design Net has no involvement with the above web site; all content and images depicted in the above thumbnail are the property and copyright of Delftship unless otherwise noted on that site. Description: DELFTship is a complete design package for application in the marine industry. It is characterised by its ability to create any kind of hullform, high flexibility, low learning curve and visual approach. It can be used for almost any kind of floating object. DELFTship uses subdivision surfaces to model the hull rather than NURB surfaces. Most hull modeling packages use these parametric spline surfaces which can be very tricky to use. Subdivision surfaces offer many advantages: 1.) No need for a rectangular control grid divided into rows and columns. 2. )More freedom in modeling knuckle lines. 3. )Surfaces can contain holes. 4. )Even the most complex shapes can be created with just one surface. 5. )The possibility to insert just one single control point.